HP Umpire Mark Ripperger ejected Angels C Martin Maldonado and Manager Mike Scioscia (strike three call; QOCY) in the top of the 7th inning of the Angels-Tigers game. With one out and one on (R1), Maldonado took a 1-2 fastball from Tigers pitcher Louis Coleman for a called third strike. Replays indicate the pitch was located over the inner half of home plate and at the hollow of the knee (px -.373, pz 1.456 [sz_bot 1.535 / RAD 1.413]), and that all preceding pitches during the at-bat were properly officiated, the call was correct. * At the time of the ejection, the Tigers were leading, 5-0. The Tigers ultimately won the contest, 9-3. These are Mark Ripperger (90)'s 1st and 2nd ejections of 2018. Mark Ripperger now has 5 points in the UEFL Standings (-3 Prev + 2*[2 MLB + 2 Correct Call] = 5). Crew Chief Greg Gibson now has 3 points in Crew Division (1 Previous + 2 Correct Call = 3). *This pitch was located 1.518 vertical inches from being deemed an incorrect call. These are the 49th and 50th ejections of the 2018 MLB regular season. This is the 24th player ejection of 2018. Prior to ejection, Maldonado was 0-2 (SO) in the contest. This is the 21st Manager ejection of 2018. This is LA-AL's 2/3rd ejection of 2018, 1st in the AL West (LAA 3; HOU, SEA 2; TEX 1; OAK 0). 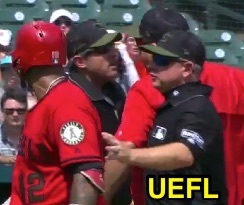 This is Martin Maldonado's first career MLB ejection. This is Mike Scioscia's first ejection since September 9, 2017 (David Rackley; QOC = Y [Balls/Strikes]). This is Mark Ripperger's first ejection since September 1, 2017 (Ryan Braun; QOC = Y [Balls/Strikes]).